Tapmatic Is Pleased To Introduce An Exciting New Product.... The TAPMATIC TapWriter. The TapWriter allows you to mark your work piece while you are machining it without the need for a secondary marking operation. Part numbers, date codes, logos and even decorative patterns and artwork can easily be created with this unique dot marking tool. It can also be used for controlled, consistent shot peening to improve a parts resistance to fatigue. Using the TapWriter for shot peening allows treating specific areas of a part without the need for masking, and no special cleaning is needed afterwards. 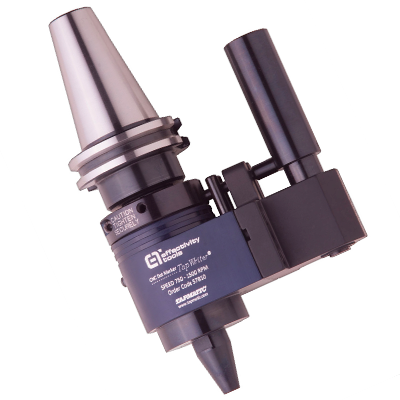 Installs easily on Machining Centers or CNC lathes with Live Tooling. It utilizes standard engraving software, but unlike engraving, dot-peen marking does not require the use of delicate cutting tools and high speed spindles. You can mark soft plastics or steel as hard as 55 RC. The durable carbide stylus is thrown against the work piece which allows the marking of uneven or round surfaces. The TapWriter is Fast. Up to 80 characters per minute or more just depending on the capabilities of your machine. Dot peen marking is widely used in the aerospace industry because the cross section of the dot has gentle curves, resulting in no significant stress concentration. With the TapWriter you have complete control of the mark. The revolutions per minute determines the dots per minute, and the velocity of the carbide stylus when it impacts the work piece. The feed rate controls the distance between dots allowing you to select the apperance of discrete dots or a continuous line.